Alzheimer’s Spouse/Care Giver Depression…how can you change it? Dear Francy: I am doing my own thoughts today. I had a change of routine…that I knew was coming but it upset me all the same. How are you coping with losing your spouse, bit by bit…even though they are still in front of you? The old relationship is fading away and as the care giver…I have to learn to adjust, not go into a depression. I hope this helps you look at change…and not be afraid of the next chapter in your life. Don’t hold on and go down with the ship…raise up and try to embrace the change and make it healthy for both of you. I actually went out last night. We have a free concert in the park series that we have attended for many years. There are two jazz artists that are really good and so I try to at least hit those nights. The featured artist this year was Michael Powers. Last year George got so he could not sit long and had to go to the bathroom. But the toilets are located a block away from the concert. We could hardly get there in time and he then could not walk all the way back! So, I knew that it would be our last time to the concert together. We have been going to these concerts for 20 years…its a summertime tradition that represented joy and togetherness and happy times…how could it end? I have hovered over it on and off all through this last year. Each time I thought about it, it seemed to represent the loss I was feeling almost on a daily basis. No more sharing things together. George here in the house, but a million miles away from our old life of best friends sharing everything together. The transition is so hard to make. I want to hold on so badly to the old…but everyday a new assault of change would arrive at my door. That one event of a weekly outing at the concert in the summer months…it had bothered so much. 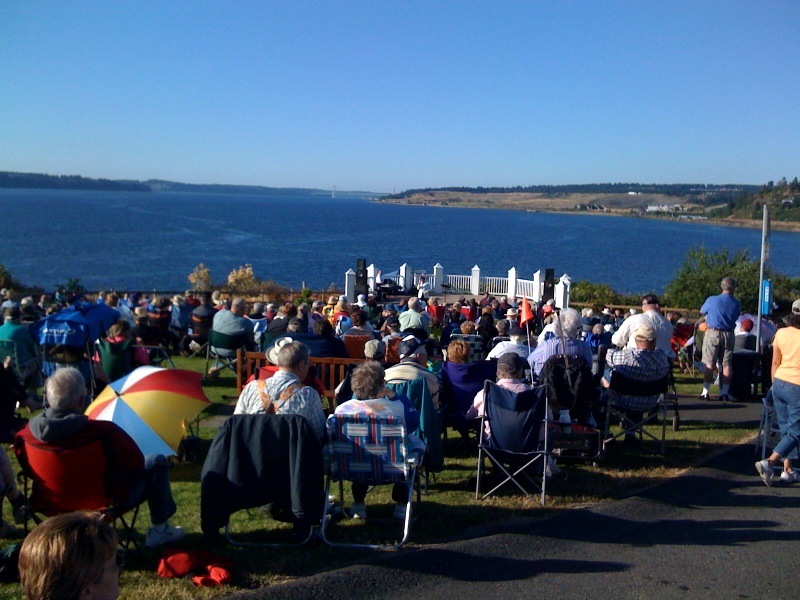 The concert is in a fabulous park on a bluff overlooking the Puget Sound…looking out to the water, the islands, the Olympic mountains and Narrows Bridge. There’s a very long train that rumbles through each night too…and the musicians just make fun of the noise. The bandstand is built like an old fashioned bandstand and as you look at it- it almost disappears and you only see the view behind it. Oh boy, you feel like you are caught up in a time warp. 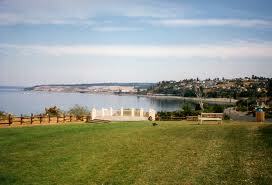 You just get so into the moment, the music, the view. I gave up the thought of taking him this year. But Cheryl circled one date with our favorite jazz guy (Michel Powers). I thought about it alot. As the time came closer I finally asked a neighbor and long time friend of he would ‘sit’ with George. He was all in…and so I invited his wife to come with Cheryl and I… it was a date. The day was hot, and I spent it making soup for dinner for the guys. I just could not think of anything exciting to make for them…so I tried a soup idea I had read about a couple of years ago. I am knee deep in zucchini from my little container garden. Thus a Zucchini Turkey soup. It was totally a wonderful soup and the guys loved it. I had a frozen pie that I baked …the dinner was ready so I could escape. I thought about all the work I had to do to get out the door for three hours…but it was worth it. George enjoyed the guy talk and I enjoyed the market, concert and girls night out. Sometimes you just have to give up on the old…and know that the new can be enjoyable too. No there was no George to hold my hand during the concert. Nor was he there to make me dance with him when they played a tune he liked. But being surrounded by my friends at the concert, I was able to take a step out alone. My future is going to have a lot of steps out alone…so I have to remind myself not to be afraid of life. To live it as an expression of what I enjoy…not what “we enjoyed” — this is the hard part of Alzheimer’s. Its the day after day of losing bits and pieces of someone you love so dearly. I know, I live it. But I have a long life to live…and this has to be my journey next to George…not my end. Here is the soup…honestly..it was delightful. I had a bowl when I got home. Chop your medium Zucchini in bite size pieces and fry them in olive oil. You want them cooked and light brown and it will take about five minutes. Then drain them on a paper towel and hold them to add at the end of the soup. Get your rice cooker going with a good brown or wild rice–you need about 2 cups when it is cooked — you can add a cube of chicken broth to the rice water and then let it cook through – Hold this, it will be added at the end of the soup. Now here is the soup itself, that I used a French pot to cook it on top of the stove so it did not stick. Use two cups of turkey or chicken leftovers cut in bite sizes. I used smoked turkey leftovers I had frozen for future sandwich meat. This is a perfect way to use up your left over roasted chicken meat (from the store). Chop into bit sizes and hold to add to the soup. OK, cook the onion till it’s starting to turn color then add in the green pepper and celery — once they have gotten soft then add in the herbs, spices and pour in the broth n can of creamed soup + the 4 drops of pepper sauce. Bring it to boil, then add in the meat, rice and zucchini — reduce the heat down and let it cook through, the rice will absorb a lot of the stock. Just before you serve you can sprinkle it with 1/4 cup of chopped green onions and add a dollop of sour cream on top and then serve with roll.